(Newser) – Stocks closed lower on Wall Street Monday as falling bank stocks led the S&P 500 to just its third loss in the last three weeks. Goldman Sachs and Citigroup each said their stock trading businesses struggled in the first quarter. Goldman fell 3.8% while Citi shares dropped 0.1%. 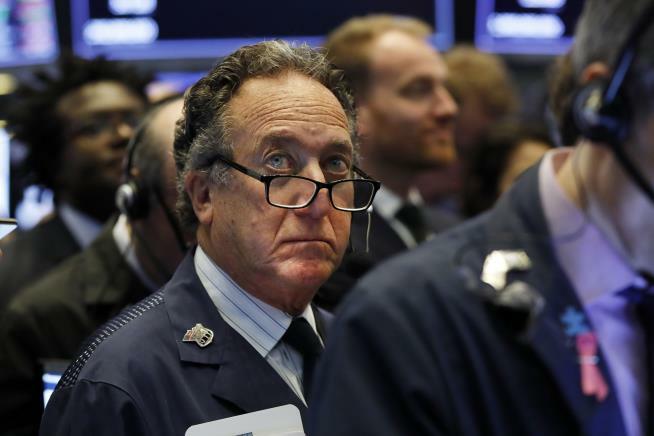 The S&P 500 index fell 1 point to 2,905, per the AP. The Dow Jones Industrial Average dropped 27 points, or 0.1%, to 26,384, and the Nasdaq fell 8 points to 7,976. Also of note: Advanced Disposal jumped 19% after accepting a $3 billion buyout offer from Waste Management. Just Third Loss in 3 Weeks. not bad He's doing great for the USA if you ask me. Look at the face on that guy.